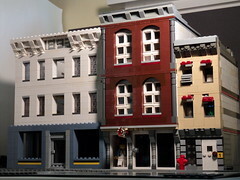 Brick Town Talk: New Camera and New Building - LEGO Town, Architecture, Building Tips, Inspiration Ideas, and more! The white building is under construction, but I'm glad with how the new camera turned out. I really like the lighting that I caught on this one. I might change the white to a more rare color, but I still have to think that one over. Hopefully I can get this building completed within the month or so, so stay tuned!